My Frenchies have a squirrel "friend" who loves to taunt them by running along the fence top safely out of reach. Yesterday the squirrel miscalculated by getting a bit too close and the Frenchies frightened him causing a barrage of squirrel profanity. 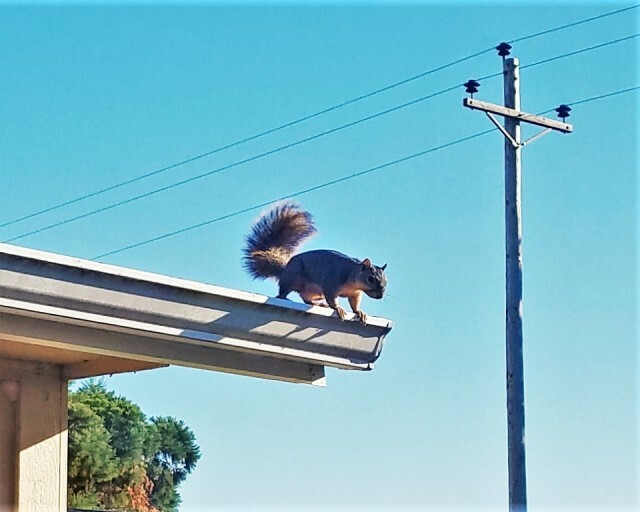 This morning the squirrel was on the gutter of the neighbor's house in full view from our living room window. Our Frenchie, Bali, was beside herself, barking madly as he made repeated feints as if to jump down to the fence top. He never did jump down and quit the game by running back across the rooftop.